Dash cam movie posted today to the website Reddit takes us to an incredible scene in Abbotsford, where amazingly no one was significantly hurt. A major collision occurred at the Sumas Way near Highway One on Sunday afternoon, just before 1:30 pm. 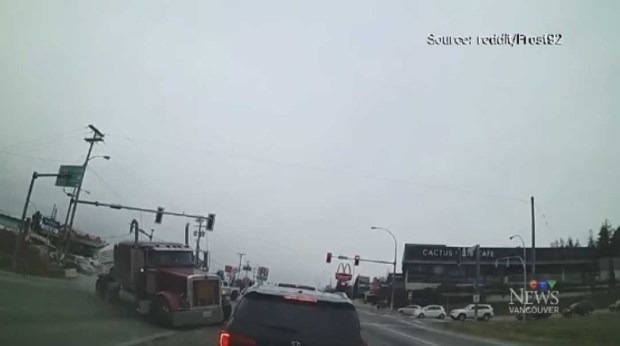 The video, posted by a reddit user known as Frost92, begins as a white pickup truck makes a left turn on a yellow light, seemingly clearing the intersection. However, as the pickup completes its turn, the truck clips an oncoming flat-bed truck loaded with pallets of roofing shingles. The semi-trailer moves into the intersection, swerving right and left, before flipping on its side and smashing into two vehicles facing the opposite direction. The semi winds completely upside-down, wheels in the air. The crash shut down all northbound lanes – and all but one – southbound lane.